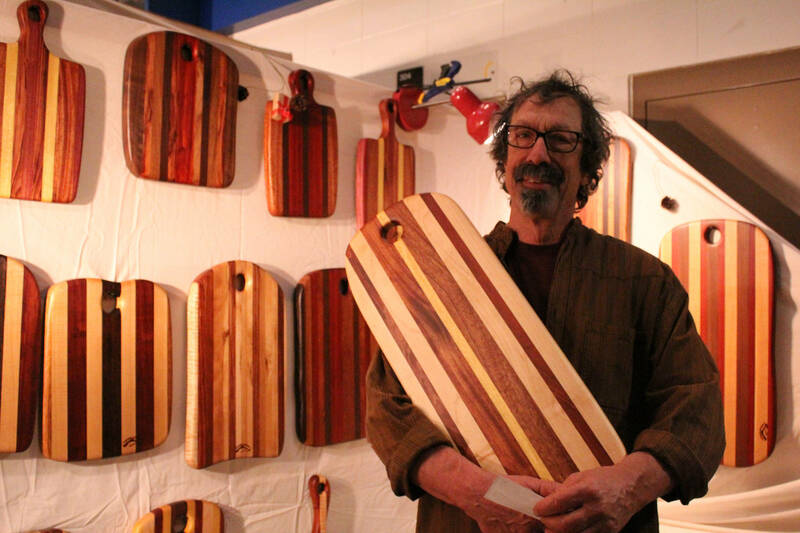 Paul Pellegrini shows off one of his custom-made cutting boards at his Homer Woods booth at the Nutcracker Faire on Saturday, Dec. 3. The annual Nutcracker Faire runs from 10 a.m. to 7 p.m. Saturday and Sunday at Homer High School. Sponsored by the Homer Council on the Arts, the fair features more than 90 vendor booths with food, music and fine arts and crafts. The Homer Public Library and Friends of the Library seek volunteers to help develop and produce a theatrical Big Read Kick-off with Pier One Theatre. The Big Read is cartoonist Roz Chast’s memoir, “Can’t we talk about something more pleasant?” Brainstorming and rehearsals are held in early January from Jan. 3-8 and Jan. 10. The Big Read Kick-off is at 7 p.m. on Jan. 11 at Alice’s Champagne Palace. If interested, contact Mercedes Harness at Mercedes@friendshomerlibrary.org or call 907-435-3195.